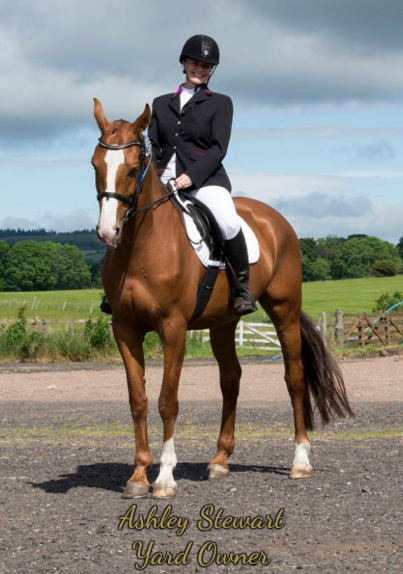 Ashley passed her Equine Science Degree with honours in 2012 - having previously worked through her teens at a number of livery, sales and competition yards. Upon completing her degree, Ashley went on to study her Post Graduate Diploma in Eduction (PGDE), qualifying her as a university/college lecturer based in Equine Studies. Ashley worked for Salford City Colleges, teaching Equine Studies to 16-18 year olds before moving to New Zealand to work at a hunt/trekking yard. During her time in New Zealand - Ashley began working towards her Equestrian Sports New Zealand Coaching qualification. Since returning to Scotland - Ashley has been working on converting this to the equivalent UK qualifications. Ashley is also a BHS qualified first aider and has past experience as a veterinary assistant. Ashley believes in treating all liveries as if they were her own. She strongly believes horses thrive in a natural herd environment with as much turn out as weather permits. She is eager to share her education and years of equine experience and wishes to run a friendly, welcoming, 5* yard.